Today new sensory deficits are making themselves manifest. My right hand is seems to be leaving the repertoire of the fully performing extremities. I noticed yesterday that my right thumb and index finger seemed to have that falling-asleep tingling sensation all day. Today most of my right hand is joining in the walkout strike, full absent. All the fingers are fully operational, I can still type. But I cannot feel what the fingers are doing by the sense of light touch like I normally could. This is weird, like typing with one thin glove on my right hand. I can see from posts over the past several days that my spelling has been going downhill pretty bad too. I wish someone would tell me, please!! I am not always an accurate judge. You can help me see how I am doing by letting me know if I don't spell good, or forget people’s names, or things like that. You would be doing me a favor. I'm Cindy...not because you've forgotten but I still haven't figured out the system! :-) Sorry! We aren't too worried about the spelling! What you say is SO much more important than the spelling. Besides, wasn't it a Twain quote you used that talked about spelling being an uncreative convention? Dad says I should keep writing about Utah places. I can write hundreds more. You guys could probably add some of your own. Think I should concentrate on those, or the "miracle" story? Which do you like better? Post both, or whatever you want. When your brain is deeply engaged you do really well. Post the things that excite you, because that is when you do your best - very few typos, and elegant language. Things flow most smoothly from you. BTW, where did this picture come from? I hate it. 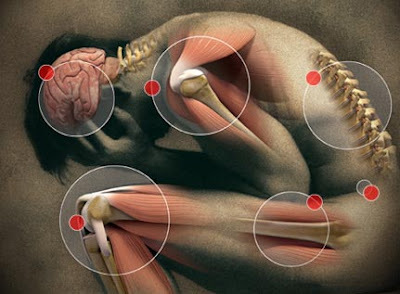 It is a picture of my fibromyalgia pain. It pains me just to look at it. What website did you pilfer it from??? I must know! Sorry, I stole the image somewhere browsing. Don't remember where or when. It does epitomize pain centers very well. I will try, with the Utah Places and Miracles chron. My migraines are almost back to the insupotable level -- the meds are not working any more. All I can do when I can't stand it is sleep. You know how it is. I'll keep trying, I promise. The family and I got you a new hat today. Pretend you don't already have this one. I think you do, but yours is really worn out. You needed a new one anyway. I have something to say to you, something I've been thinking about. It pertains to your comments in this post. It's too much for here, so I'll write something on my blog. Read it and think about it, ok? I enjoy reading whatever you write. You could probably write about opening mail and I would enjoy it! :-) Just write...the stories of where you have been and what you have done in your life are wonderful. Reading about the trials you've been through and how you are dealing with it and learning from it is inspiring too. Yeah, just write! Whatever and whenever. Your children and grandchildren will love to read all of it too, in years to come. I think you've been most of the places we have, and so many more! My kids have been in the Uintas with Scouts, so are familiar with Grandaddy Basin and have stories to tell of boulder jumping and freezing and football in a marsh--there is something wonderful about being in the outdoors and surviving. We've been to Goblin Valley and Temple mountain and hiked or camped in some nice places but usually more "civilized" than the places you go, since we had little kids along. Carls sister has a cabin in the Uintas, kind of up by Christmas meadow I think--by Bear River Lodge--it's a lovely place! Probably the only places we have been, that you haven't, are places at Lake Powell. Some of them are very cool, but you get there by boat so that's kind of cheating! Plus, I'm not sure they're all in Utah!